Two postcards written by Thomas Minshall to his wife, Eva, and sent from Aldershot in October 1915 are shown below. At this time Thomas was a Lance Corporal with the Cheshire Yeomanry and throughout 1915 the Regiment was stationed in Norfolk on coastal defence duties and undergoing training. I have come into the town this evening to buy a few things, so not time for letter. I received yours this morning; and will send long letter tomorrow. Keeping tip top, hope all are well. I am just going for a short walk with Sgt. Childes. It is a lovely afternoon, so we are going to the flying grounds. I will write letter after tea, before I go into the Gym. I thought you might like pic of the Gym. I hope your cold is better, & Ma & Pa are quite well. 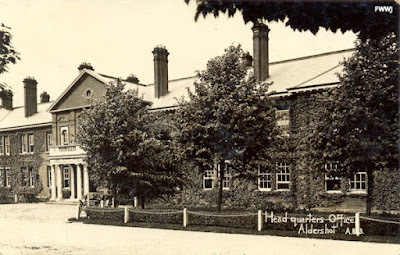 So, why was Thomas detached from his Regiment and what was he doing in Aldershot? He was likely to have been undergoing a course of physical and bayonet training there preparatory to becoming an instructor. The Army School of Physical and Bayonet Training was based at Aldershot. This school and later others modelled upon it were not for soldiers. Their purpose was to instruct officers and non-commissioned officers in physical drill and bayonet work sufficiently so that they could teach essentials to the rank and file. Before the war an average of only 360 N.C.O.’s went annually through the Aldershot course. By 1917 over 6000 certificates a year were granted to officers and N.C.O.’s. 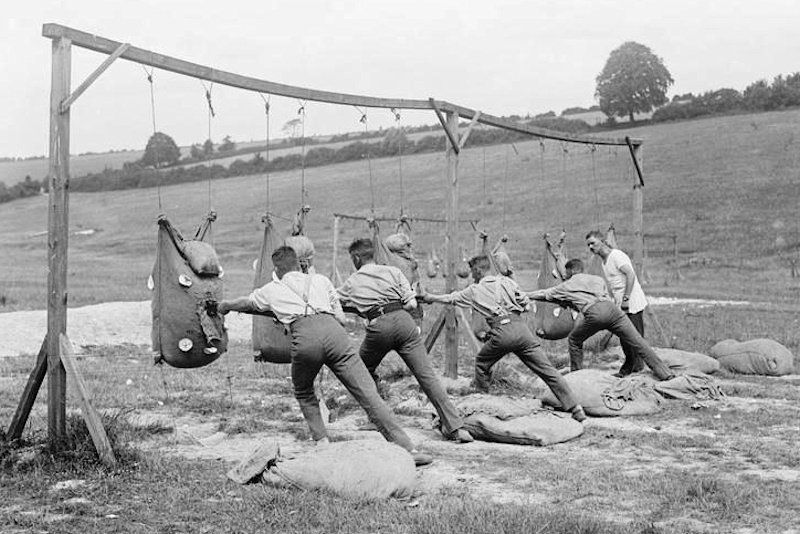 Skilled instructors were needed to give these courses but at the outbreak of war nearly all the staff at the Aldershot gymnasium had automatically rejoined their units. In mid-September 1914 a War Office communiqué appeared in the press on behalf of the Army Gymnastic Staff seeking gymasium instructors. The Swedish system of physical drill which was introduced into the army some years ago aims at strengthening all the muscles of the body simultaneously, not just those of the arms and legs at the expense of the other part if the body. Initially ‘Bayonet Fighting’ was considered to be the most important physical training skill taught by Staff Instructors. But training had to evolve to meet the demands of modern warfare and other skills such as bombing and anti-gas measures were also taught. Imperial War Museums have a ‘Podcast’ and associated text and pictures on 'Weapons of War' and army training. From the beginning the reality of their work was impressed upon the men. In order to keep the object of bayonet practice always in mind, pictures were used that showed the straw filled sack used in practice fading into a German soldier. 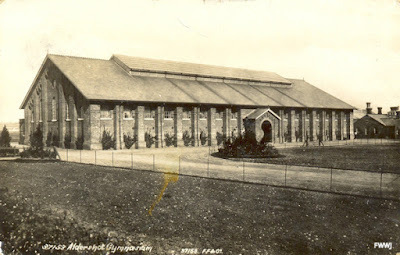 Through the courtesy of the War Office an American writer was permitted to visit the Physical and Bayonet Training School at Aldershot, and gathered material for American readers. 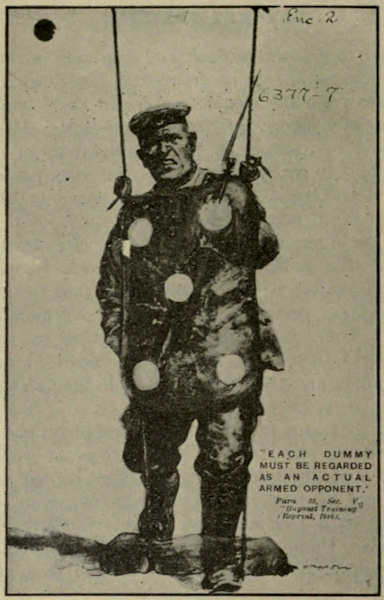 His article published in the Philadelphia Public Ledger in June 1917 gives detail on the training of instructors. The period of instruction lasted more than two weeks. When the students at the Headquarters Gymnasium got their certificates they returned to their units and put the men through exactly the same training they had received. In the end, every infantryman who carried a bayonet was trained in the same way. Thomas Minshall is pictured standing on the extreme right on the back row in the postcard below. On Saturday 25 September 1915 the Chester Chronicle reported on the training and camp life of the third line, 7th Battalion, Cheshire Regiment. From 8.30 until 9.30 physical drill parade takes place under duly qualified instructors. 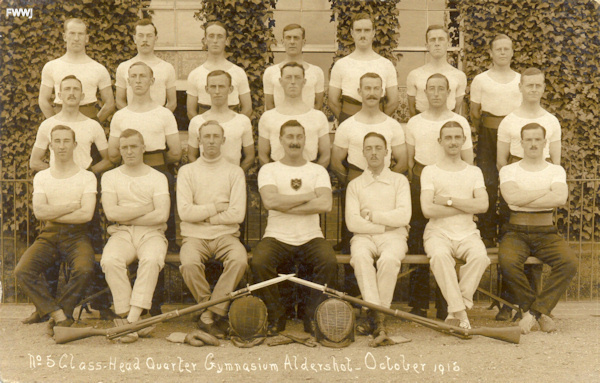 This drill is the lines laid down by the gymnasium experts at Aldershot, and varied by such games as will make the men agile sharp in their movements. At first the recruit doesn’t take this form of drill, and terms it physical torture, etc. ; but he soon changes his opinion and votes it the best parade of the day. It is somewhat astonishing to note the change which takes place in a young recruit after a few weeks of progressive physical training. 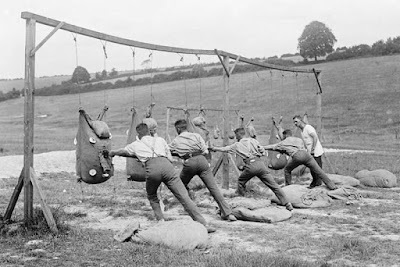 Thomas, who pre-war had been a gymnastics instructor in Northwich, Cheshire, would have been well qualified to train the men during their 'best parade of the day'.